We are pleased that after few years of existence and growing on the Web, we are very excited to publish our very FIRST INTERVIEW. MR. LAXMAN, or do I say, the Bug Bounty Hunter, discovered a Bug which was Capable of deleting all your Facebook Photos. He reported the issue to Facebook Team via his blog and Youtube video and was Rewarded the sum of a whooping $12,500!!! (about 2.4million Naira) by Facebook Team. His Exploit hit the web between Thursday, 12th and 13th February, 2015, since then He has been the newest reigning Security Hero. Days later I spoke with Him about an Interview, I needed to bring him here and show you this guy. Gladly, he found time to Hangout with us. Over to You, MR. LAX! Hi, I am Laxman Muthiyah, 22 Years old, From Tamil Nadu, INDIA. Passionate about computers and technology stuffs. I have completed computer science engineering last year. Now working as a web developer. Gonna quit this job soon. >> When Did You Start Learning Hacking or Bug hunting? 4 years ago started learning things related to information security as well as hacking. >> What were your First Exploits or Bug Hunts. As said in my other interview. My first bug was improper validation in a mobile recharge website. It allowed me to do mobile recharge without payment. This flaw exists in their wallet feature of their website. They have done only onsite validation (js validation) for input values and they didn't validate anything in server side. I just tampered the data sent to the server i.e entered negative values in amount field. That's my first finding. >> Why did You Choose Security research? I love to keep my things secure, this might be one reason why i got in to Information security field.tongue emoticon What if you want to keep an important information secure ? will it be secure forever? this question made me to think and this is why i am being here. I don't have any significant reason towards it. I am just passionate about Infosec and that's it. >> Where did you learn so many things ? Please share your Learning sources. "Google is God" this statement means alot to me! I use to Google everything which i don't know. Ethical Hacking Workshop by Sunny Vaghela gave me new ideas. This type of workshops would be very useful for beginners who are interested in hacking. Make use of R.H.A, hack forums, ­Resources.infosecinst­itute.com to learn hacking stuffs. There are thousands of websites to learn. My advice is "Google Everything" because you may not get consistent place for everything you want to learn. Make use of the entire internet using Google. >> So far, After your Exploit and Reward from Facebook Team, you have been Featured on Big Websites Like BBC, MASHABLE, TECHCRUNCH, YAHOO NEWS, NDTV. You turned A Tech-celebrity within some Days. How does it Feel, and What does this mean to you? Its like dream come true I realized that "Hardwork never fails". I am very excited to see my finding get featured in many reputed websites. >> There are Many Others in the Bug Bounty Program, who are still Hunting, trying to find a Bug and Get Rewarded and/Or Be Famous like You, What is Your Advice to them and other people that are into Security Research? First thing is to understand what a security vulnerability is. It may take time for beginners to differentiate a security vulnerability from other software bugs. Read the writeups and proof of concepts of previously fixed vulnerabilities . Many security researchers have their own blog where they ll share their findings. Do follow them. You may get more clear idea about it. Never giveup. There is no such as an ending, just a new beginning. All the very best for everyone who are trying to find bugs. - "The Expert in anything was once a beginner." - "Never give up There is no such thing as an ending, just a new beginning." "It always seems impossible until its done"
A quote from a person who is one of my inspirations. >> Can you Share with us Your Future Career Plans? Also On an Interview with another blog, You said you're Going into Blogging? Sounds interesting, Can You tell us a little bit more about it? I will continue security research and simultaneously I am going to blog things related to technology, hacking, vulnerabilities, tech tricks etc.. Later I'll also write about other things like fitness, business etc.. Your website is very useful and informative. You are doing great! I am just a beginner in blogging. The only thing I can tell you is "Keep up the good work"
>> We really appreciate your Presence here, do you have any more Additions as Conclusion for us? First of all, i thank the author "Edi Dominic Ifediri" of EdiTweaks for this interview. Thanks everyone for taking your time to read this interview. 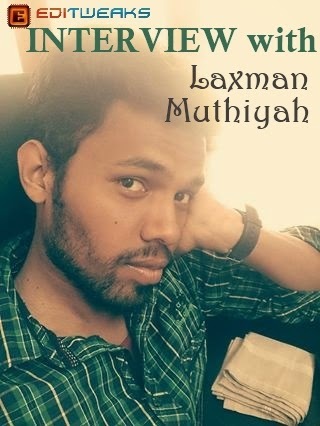 >> Thanks so much for your time to Interact with us Here Bro & I wish you the Best of Greater Success in all your endeavors Laxman! Now back to you there Reading this with either your Computer, Phone, Tablet, Ipad or any device, this post goes beyond discussing about achieving something Huge as Fame and Reward, it's about useful Information SECURITY, and using this knowledge to protect people's data like Laxman did. We hope this Fresh stuff was worth your time, we hope this Interview was very Educative and Inspiring for you. From Me and Laxman, we say again... Thanks for Reading. You can Support by Hitting the SHARE & LIKE Buttons Below. And if you have any Message for Laxman, or any Questions or contributions, use the COMMENT Box below, He's much around to answer you.